Blog Cheers to 20 Years! Celebration of Curls, Love and Unity! 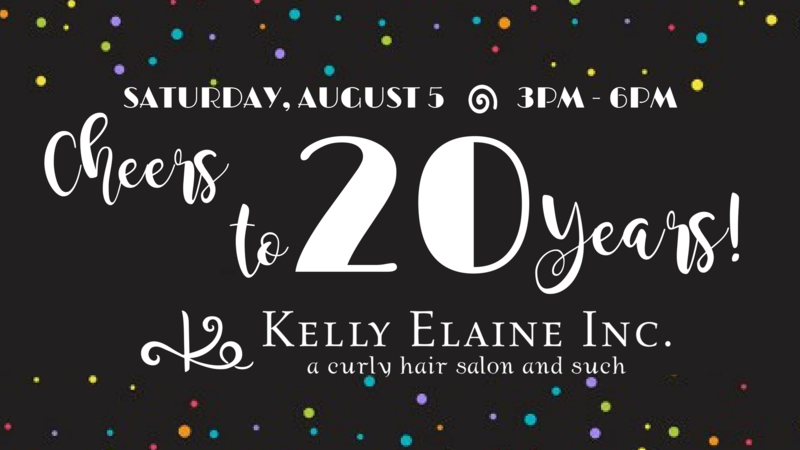 Kelly Elaine Inc., a curly hair salon and such, Pittsburgh’s Premier Naturally Curly Hair Salon is celebrating 20 years of hair beautification! Cheers to 20 years – and curling on to many more! Come join the curliest celebration in town for fun food, fun games, great music, fab prizes and lots of laughs! 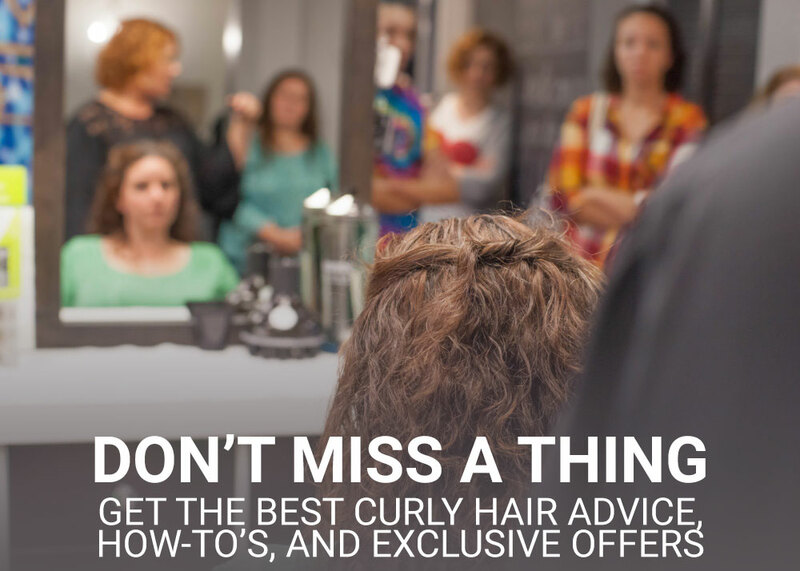 Plan to participate in the epic cheese curl eating contest or show us your best curly moves for our “Twist and Shout” dance contest and maybe even nab a fabulous prize or two! Eat some sweet treats, including cookies by Nice to be Iced and delicious cupcakes. Featured interactive entertainment includes Soma Chatterji, Pittsburgh’s Favorite Mehndi artist and a balloon artist from Airheads Balloon Art. 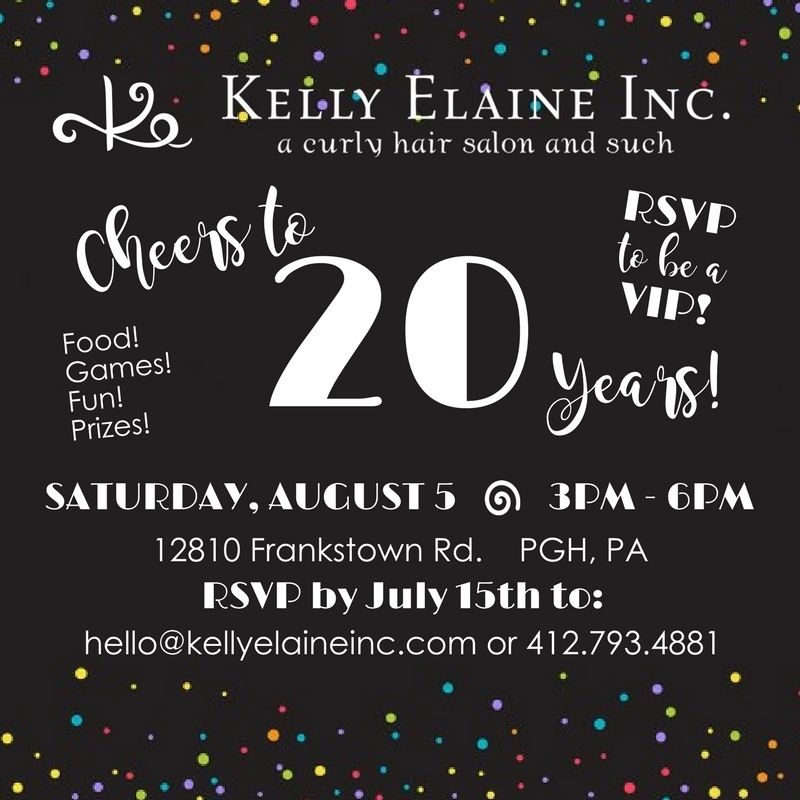 To ensure you receive your very own VIP SWAG bag, please RSVP by July 15th to hello@kellyelaineinc.com or 412.793.4881. Only those who have RSVP’d in time will receive VIP SWAG so RSVP to be a VIP! 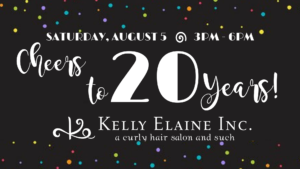 In the spirit of Kelly Elaine Inc.’s mission of diversity and unity, and to give back to the community, proceeds from our celebration will be donated to Pittsburgh’s beloved Randyland. Please consider participating in the donation opportunities available. Special event parking is available at the First Reformed Presbyterian Church on the other side of Dollar General. Overflow parking is available across the street at Dave Smith Auto.